The Saint notes to his hearers (and thus to us, too) that we are to make a request of the Holy Spirit for His gifts, the same gifts given on the original Pentecost. These gifts are promised to make perfect the senses we have in our bodies, and given as the Spirit sees fit to give. We are given what we need according to the Spirit’s discernment. But we are to ask, no beg, for the gifts of the Spirit. In the Divine Plan for man and woman is that our bodies are the locus of our divine revelation and the inner life of the Trinity. Anthony notes that we are to be filled with “a keen sense of sorrow”: what could this mean? 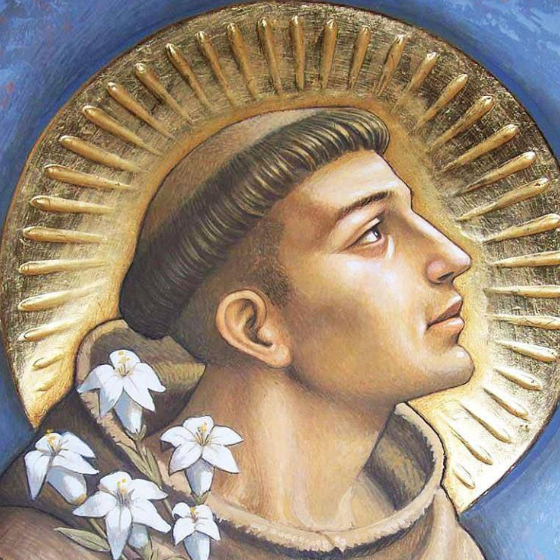 I take him to indicate that like his patrons Saint Francis and Saint Clare and a great spiritual tradition, we are to take up the work of conversion and to live humbly. In this manner, a life penance helps us to recognize our human need for Christ, for THE Savior; According to Aquinas, “To act from need belongs only to an imperfect agent,” not to God (ST I, q. 44, a. 4, ad 1). Our imperfections are a source of sorrow. A keen sense of sorrow for sins that wound and estrange us from the holiness of the Trinity and the communion we ought to share with one another. The “fiery tongues for confessing the faith” is an apostolic mission: to preach the Gospel, Christ crucified and risen, like the great St Paul and the Church Fathers. Confessing the faith –giving witness– to the life offer to us by the Lord. Preaching, I am sure Anthony would agree, does not only mean preaching of competent clergy in Divine Services, but in the ordinary places of where we live and work and spend our leisure time. Today is the day of salvation.